Today we’ve got details about a worthy event that will help a young boy’s medical expenses and provide you with a chance to obtain some limited edition fine art prints for your walls! 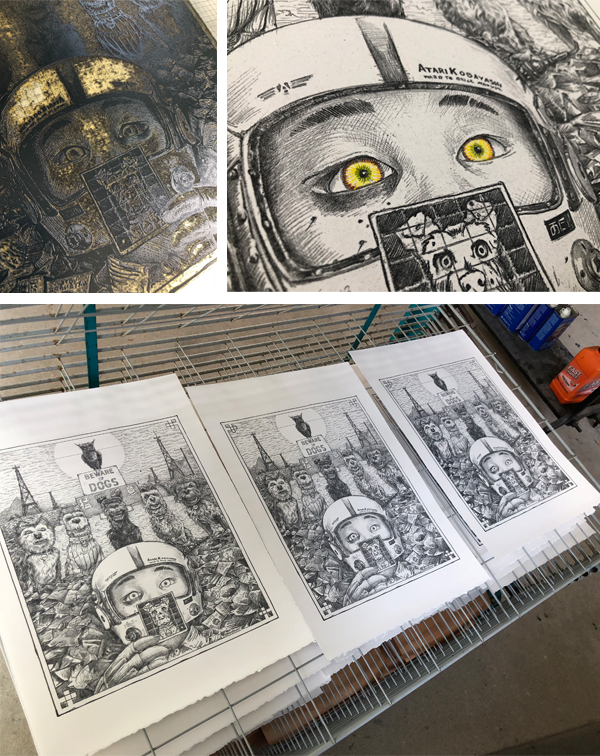 Prints for Platelets is helping raise funds for Nico Bond, the 17-month-old son of Arizona Master Printer Brent Bond of Santo Press and artist Veronica Villanueva. Since November of 2011, Nico has undergone 2 bone marrow biopsies, over a dozen transfusions and is still undiagnosed with a blood disorder that leaves him with very low platelet counts. 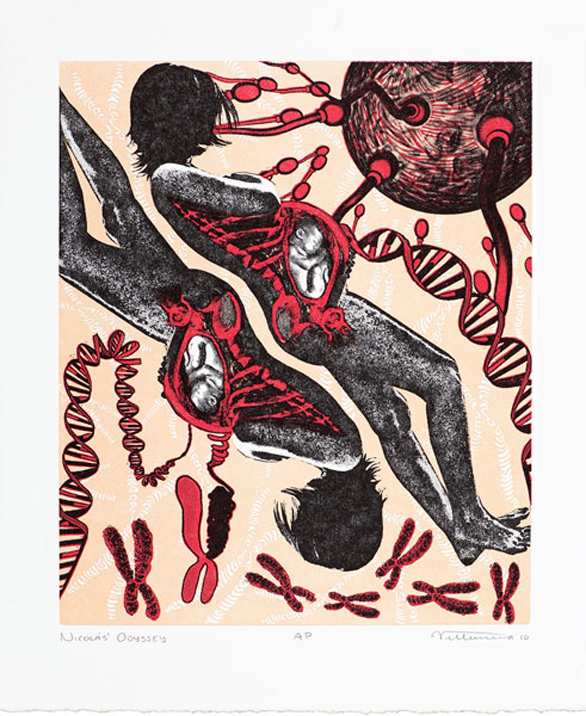 Prints for Platelets will give you a 20% discount off all Santo Press Prints with 100% of the proceeds going to Nico’s medical expenses through the month of May. 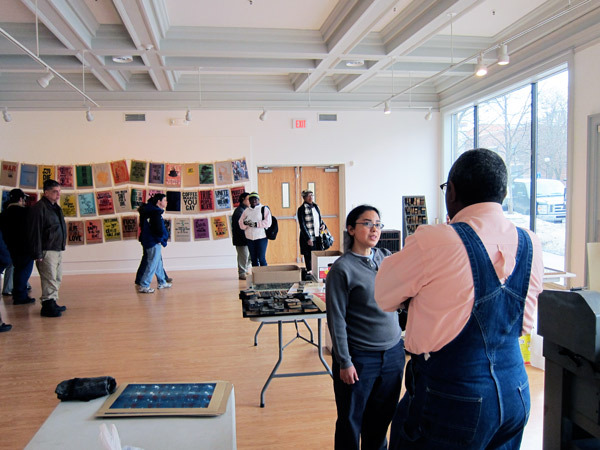 Santo Press Prints offers high quality relief prints, monoprints and monotypes from 16 regionally and nationally recognized artists. Shown above is a photopolymer and reduction linocut from Veronica called Nicolas’ Odyssey. Veronica tells us this about the creation of this print. Getting pregnant wasn’t easy and the pregnancy was a high risk one. I made this print when I was pregnant with Nicolás. It seemed that even before birth Nico has gone through a whole odyssey. And it seems that his odyssey continues… The key image was created digitally and relief printed from a Boxcar polymer plate, colors were developed via a reduction linocut. 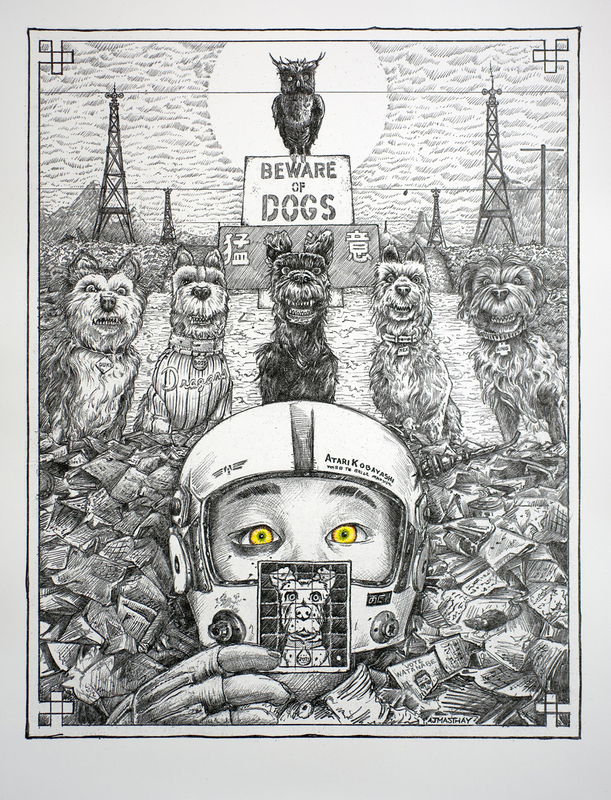 The print was from an edition of 50 which was donated to Mesa Contemporary Arts at Mesa Arts Center for their annual fine art print calender fund raiser. 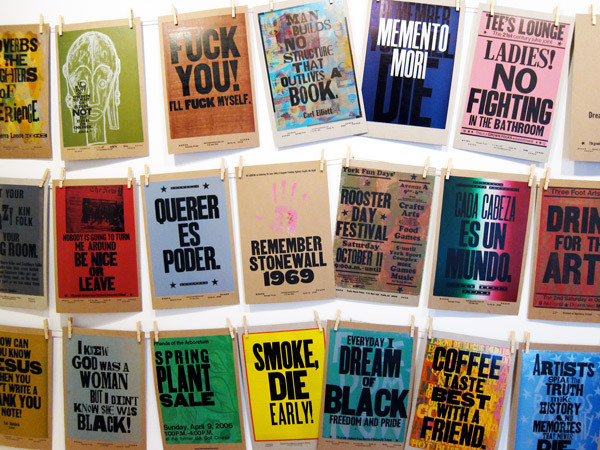 Click here to go to the Santo Press website and choose one or more signed, numbered, and titled prints from the artists and receive the 20% discount through the month of May. The prices are very competitive and with an additional 20% off, it’s an easy but meaningful way to help this little boy and his parents while supporting fine art printmaking. 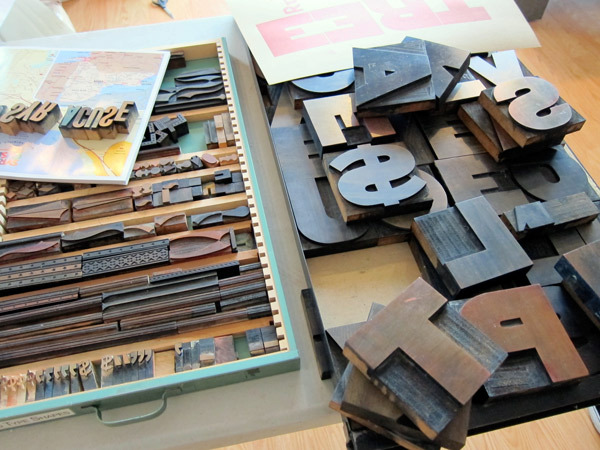 Need holiday gift ideas for the letterpress fanatic in your life? 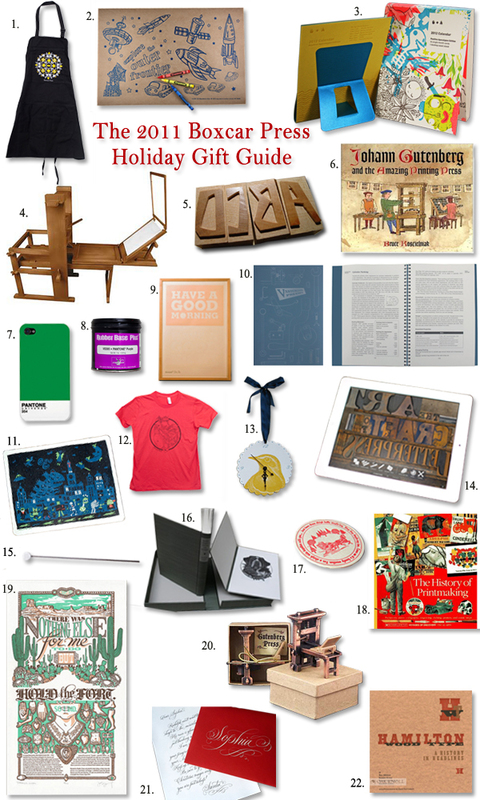 We’ve put together a list of our favorite gifts for this holiday season—we found some amazing letterpress pieces online, along with some great books and handy supplies that any printer would love to receive. 2. 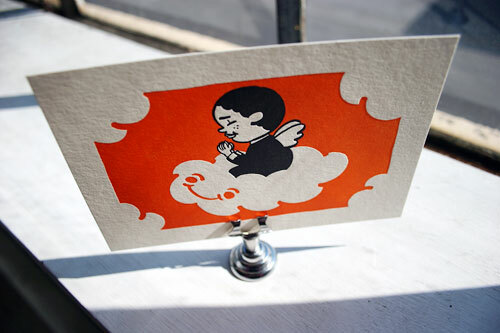 9SpotMonk letterpress placemats: 10 by 15 inch placemats, letterpress printed on 100% Recycled Kraft Paper, and packaged in a sealed, clear cello bag with 3 non-toxic crayons. $14 for a set of 24. 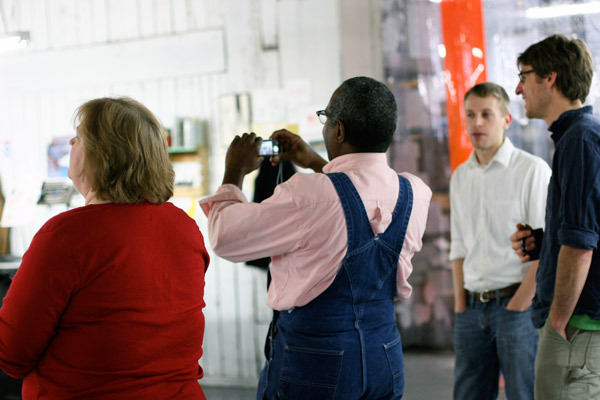 Of course, it was only fitting for a Boxcar contingency to go visit Amos in action on the opening day of the exhibit where his passion for wood type, bold color and political innuendo took center stage. As a sponsor of the exhibition, one of our old Vandercooks stands proud and at the ready now through April 4. More details can be found at the Community Folk Art Center’s website. If you’re in the Syracuse area, don’t miss the chance to take part in this special event. 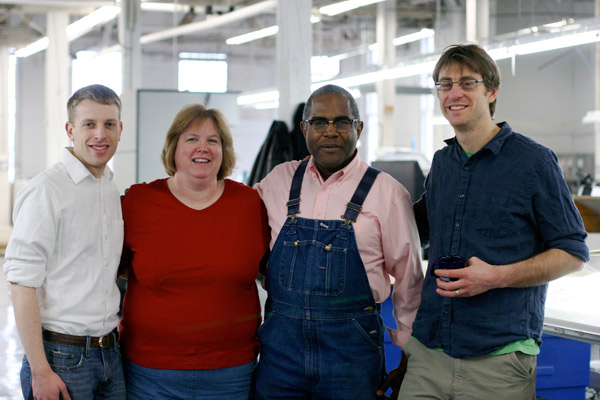 Thanks for stopping by, Amos! 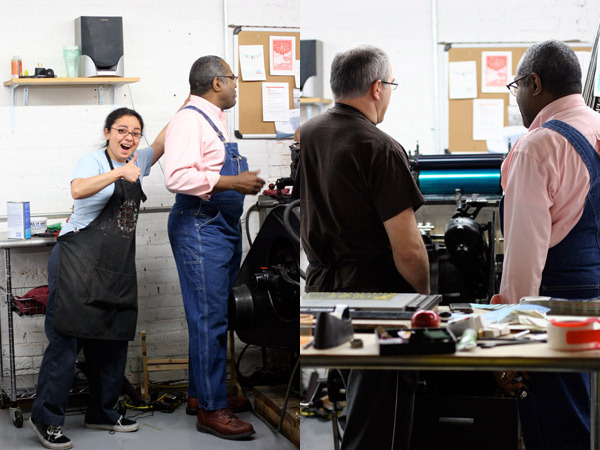 One of the coolest collaborations Boxcar is proud to be a part of is our sweet partnership with the YMCA’s Downtown Writer’s Center here in Syracuse. 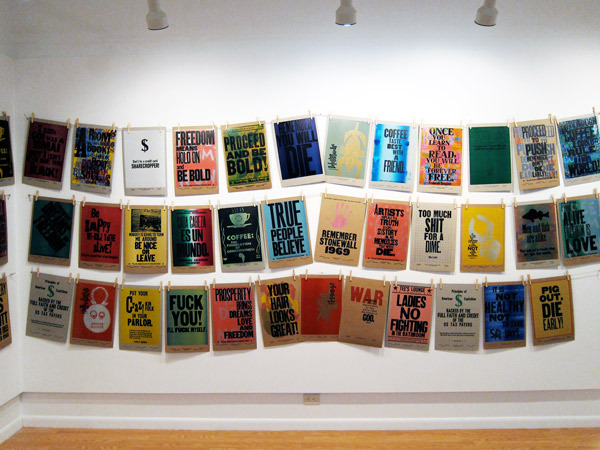 In 2002, the Downtown Writer’s Center launched a broadside series as fundraiser for their reading series. 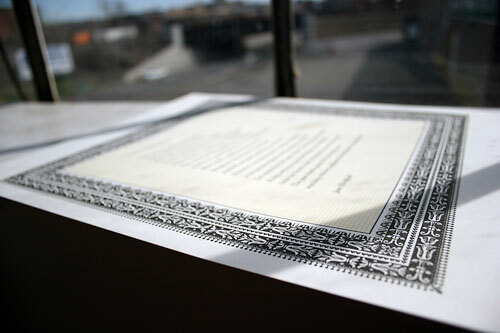 Two poets are selected annually and Boxcar’s own Harold Kyle takes the lead on designing and printing the broadsides in support of the series. 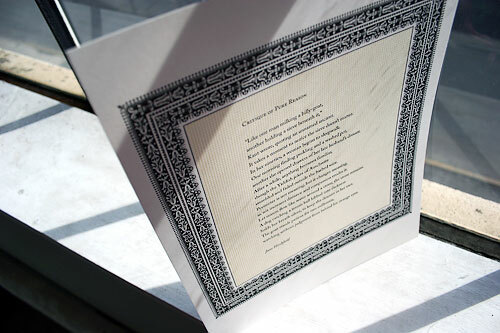 This recent broadside is for Jane Hirshfield’s poem, “Critique of Pure Reason” and Phil Memmer of the Downtown Writer’s Center calls it one of his favorites from the series. 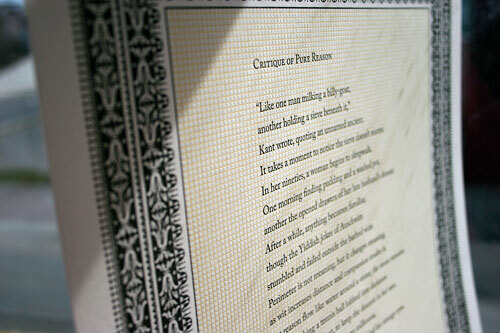 As Phil notes, “The detail in both the border and background is marvelous, and serves to echo the subject of the poem…and the careful way in which the poem itself is presented is simply perfect.” Phil also shares that the best commentary on the broadside might be from Jane herself, who gasped aloud when she first saw it – we love that! 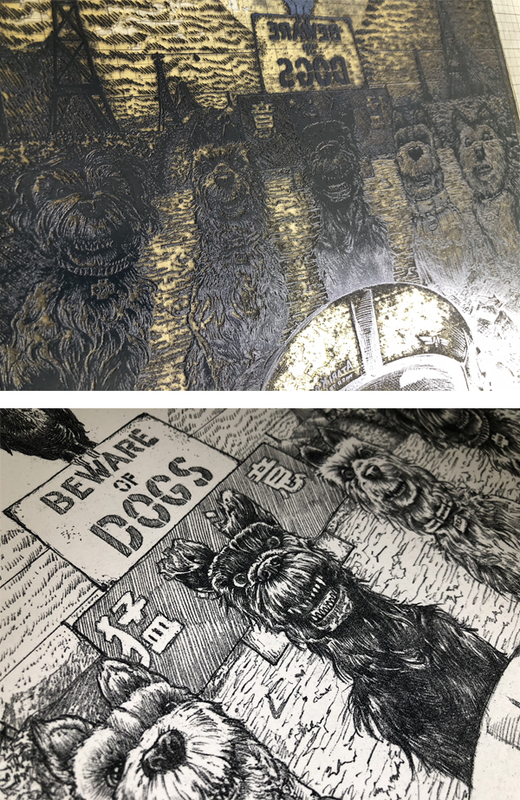 The opportunity to print these bold limited edition letterpress prints, the first release from the Cloudy Collection, was a really cool experience. 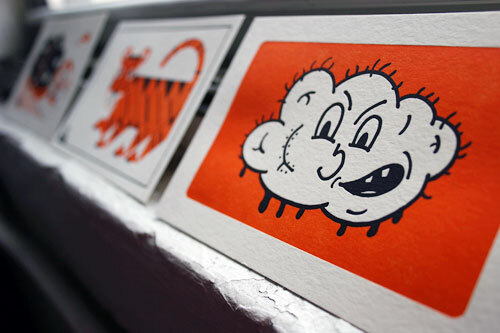 Boxcar’s relationship with David Huyck, the self-proclaimed instigator of the Cloudy Collection, dates back to the college years and recently took shape in the form of this really fun collaboration between David, a collection of highly inspired artists, and us. Keeping the Cloudy Collection prints affordable was a central focus for David in developing the project. Ultimately, each of the seven prints was letterpressed onto one large sheet of paper and then carefully trimmed to the finished 4×6 size. 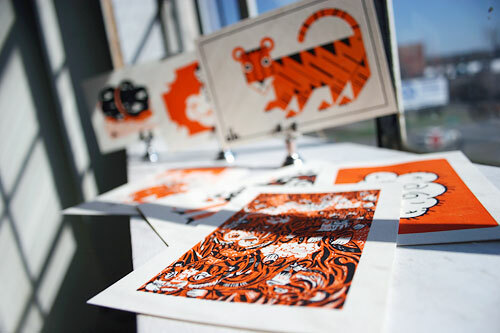 As they were letterpressed together, the ink colors needed to be the same for each print so color became a major unifying factor in the designs. David used that as an opportunity to suggest a theme as a way of keeping the prints conceptually linked as well so the prints would truly feel like a cohesive set, despite having been dreamed up by different artists. With clouds on the brain, the theme was in place and the Cloudy Collection was born. Each Cloudy Collection set will feature an offbeat seven prints, with an eighth bonus print. At times the bonus print will be offered as a free addition to the collection of seven, but there are also plans in the works to offer annual collections of just the bonus prints from each print set, intended to be released quarterly. The bonus prints will also be available for sale individually. For the upcoming second set of prints, due to be released late next month, David is moving away from the orange and black palette and adopting the classic ice cream sandwich color combination of pink and brown. 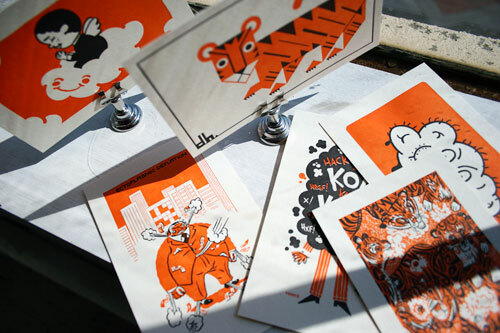 Each new set of prints will feature varying colors, themes and artists to keep the collection fresh and to help draw a broader audience to this unique series of ongoing collaborations. It is David’s hope that with each new contributing artist, their following of fans will visit the site, become intrigued and ultimately get introduced to new artists and new perspectives. With Boxcar’s own eco practices as inspiration, David made sure to keep an environmental perspective in mind when working on the project. David says, “Boxcar was an inspiration here – running on 100% windpower and using vegetable-based inks made me feel like I could add an eco-friendly layer on top of the idea of having great art for sale.” A portion of proceeds of the print sales will be dedicated to The Nature Conservancy, an organization David’s wife has worked with extensively over the years, and a special Earth Day promotion also helped to raise additional funds. Thank you, David, for the opportunity to work with you on this great project and for allowing us to share it with everyone! You can purchase the first set of prints from the Cloudy Collection on the official website for just $35, but you better move quick as we were excited to learn there are only 5 sets of the 100 limited edition sets remaining!